Pápai Páriz Ferenc, Album amicorum p. 281. * This motto is a paraphrase of the well known Virgilian verse “omnia vincit amor” (Eclogae 10.69). With piety, justice and temperance. With this and with sincere heart I wish a safe and fortunate journey to the noble and experienced Mr. Pápai Páriz, who after a long peregrination finally turns back towards the hearth of his home – that I myself would also like to do –, and I recommend myself into his memory and benevolence. In Leiden, on September 8, 1725. 281. Leiden, September 8, 1725. Gajdó Dániel of Csernáton (Csernátoni Gajdó Dániel) was born in 1696 in Alsócsernáton, Háromszék county (today Cernatu de Jos, Roumania). He studied in Nagyenyed (Aiud), then from November 1721 at the university of Frankfurt an der Oder, and from September 19, 1722 at that of Leiden. He returned home in 1726. He was a pastor in an unknown place, then from 1738 in Gyulafehérvár (Alba Iulia). In 1749 he was elected deacon of the Reformed dioecese, and he died on September 6 of the same year. Apart from his funeral orations, he wrote a funeral poem on the death of Ferenc Pápai Páriz, Sen., and a laudatory poem to Ferenc Bala, in the book of this latter that was published in Frankfurt an der Oder in 1722 with the title Lelki élet. 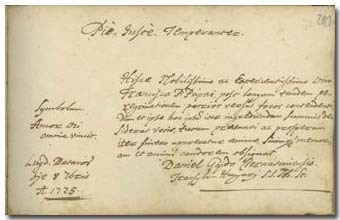 Dániel Gajdó of Csernáton wrote in the album in Leiden in 1725. Ferenc Bala, whom he greeted in a poem, and Pál Kamarási, with whom he wrote a funeral sermon (Keserűség sírhalma …, 1733), also wrote in the album (pp. 457, 445).